About STYLETAG.com: Setting out as India's first online curated fashion and lifestyle destination, STYLETAG.com is a shopping website that hosts flash sales with curated styles for a limited period at up to 70% off. We curate designs from leading designers as well as the new stars on the horizon. The product portfolio of Styletag encompasses a range of affordable luxury products such as apparel, bags, shoes, home décor, toiletries and accessories such as scarves, watches, snoods, etc. All the products are hand-picked by us and provided exclusively to our members through limited time events. No sooner did I discover STYLETAG.com than I fell in love with it! 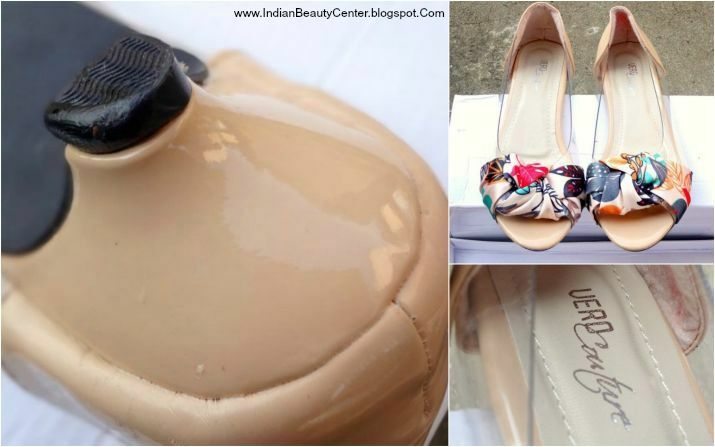 I shopped for some bags and shoes recently from this online shopping website. The website is really easy to browse through and you can find what you need easily using the search bar or category tabs. They always have sales and discounts, offers going on and you can easily find amazing discount codes and achieve a heavy price drop! You can get up to 40% off or even more on Vero Couture brand on their website. Choosing products on STYLETAG.com is really tough because whatever you would see, you would instantly love. I chose the products I wanted and placed an order. Placing an order was a piece of cake. You just have to register on their website and enter your address and payment options. They have Cash On Delivery Available and I had to pay flat Rs. 99 shipping charge on my full order. You can also use your Facebook or Google+ account to sign up on STYLETAG.com. I was expecting my order to arrive pretty soon and I was correct. My order reached me in a humongous box in just 4 days. I was very happy to see the huge cardboard box with an outer protective plastic covering. All the products were kept inside the box safely, products that needed extra safety were bubble wrapped. I received everything is proper condition and nothing was damaged. Coming to the quality of the products. I was just amazed at the excellence of the products. They were in such good condition and I just loved everything I got. I received exactly what was shown on the online retail store. The shoes, the heels and the bags everything was in tip-top condition and looked really fresh. I was really happy to have such an amazing shopping experience with StyleTag. No hassle and no problems. In my haul from STYLETAG.com, I got a leatherette bag which is very spacious and all my necessities can easily fit into it. 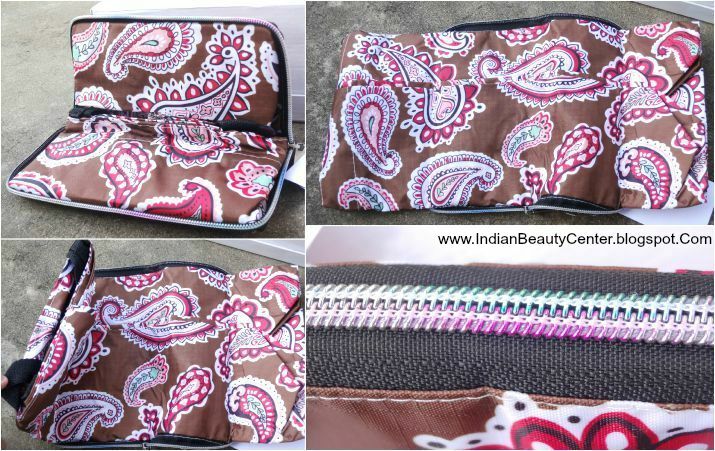 There is a pouch inside for keeping small things and a small pouch outside the bag to keep important things handy. The black is brown-black in color and looks really chic. 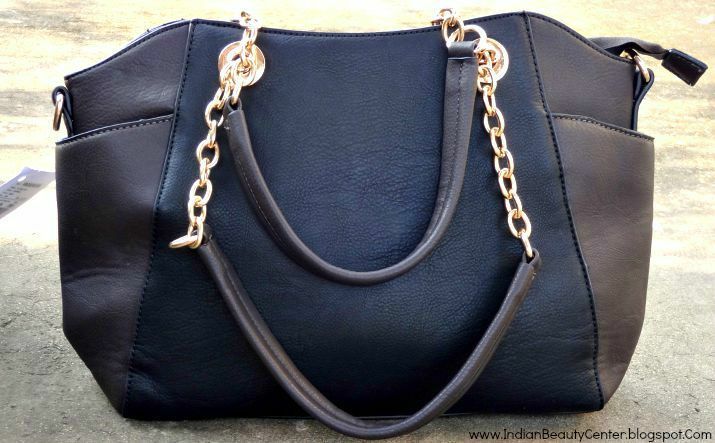 I totally loved the look of the bag and it is just of the prefect length and size. Would suit all heights and I am pretty sure each one of you would fall in love with this handbag. 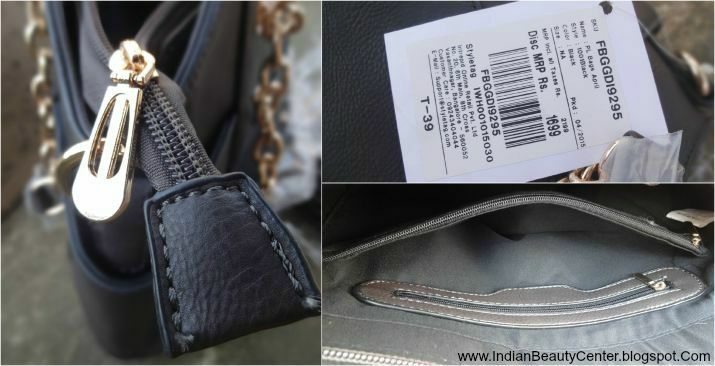 I got a 40% off on this gorgeous shoulder bag, whose original cost is Rs. 1699. 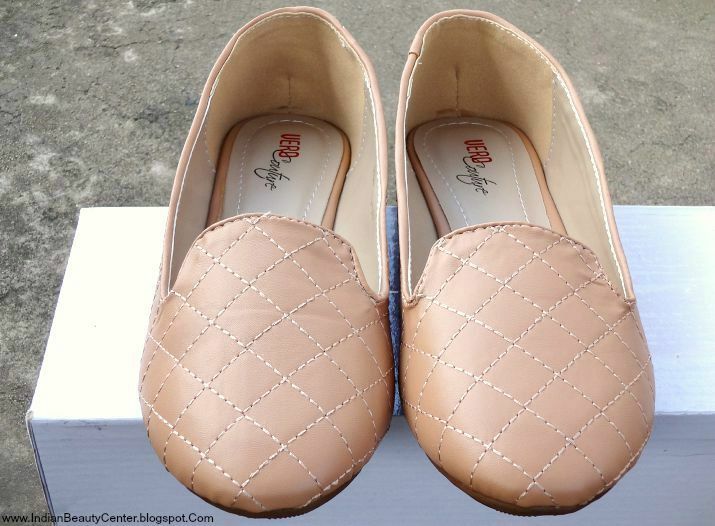 I also got Brown Quilted Ballerinas, which are soft and comfortable shoes one can wear everyday. I love the apricot color of these shoes and they look really nice and fit me perfectly. Very comfy, stylish and inexpensive. original cost is Rs. 1399 but you can get a 40% off on it if just like me. These shoes are just beautiful! Cinderella always fascinated me and so I opted for the See through Kitten Heels which have such a vibrant color and they just fit me so well. Looks really attractive and they are transparent on the sides, which is even more classy. the sides are made up of plastic, but it is quite strong and durable. Also, the heels are not too high for me and are just right. 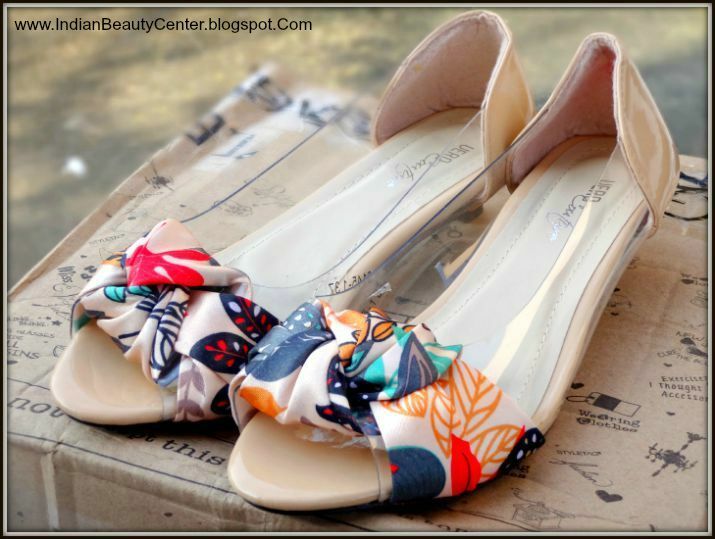 The front portion of these heels is just adorable and colorful, vibrant and would sure make you stand out in the crowd! You can get a 40% off on these too. STYLETAG.com was generous enough to send me 3 sample products- One Tvam Lip balm, a small sample sized bottle of hair oil by 21 herbs and also a small sample of Tvam Gold Soap. I was really excited to find these unexpected goodies in my parcel. Finally, the best product in this entire box was the Brown Funky Paisley Foldable Tote Bag. 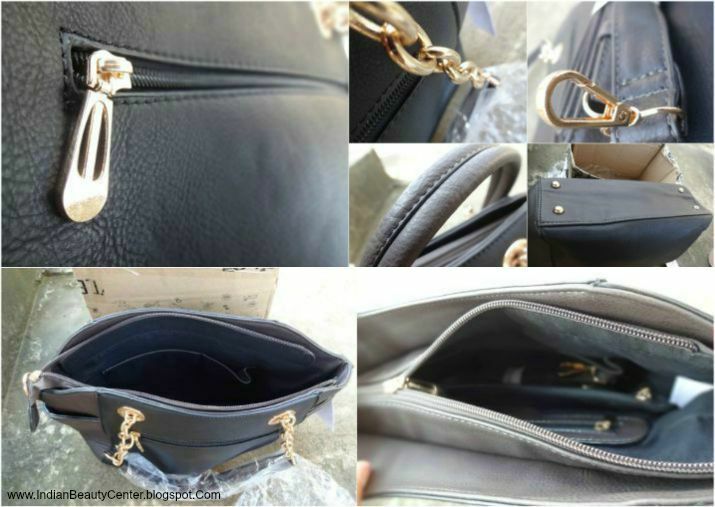 It looks like a small handbag at first, but when you unfold it after opening the chain, it becomes a huge shopping bag, in which you can easily keep a lot of stuff. It also has a chain inside to secure your belongings. It is really inexpensive and after discount cost me something around Rs. 339. It is a very good gift for your friends and such bags are pretty uncommon but really stylish and they just add to your glamour. 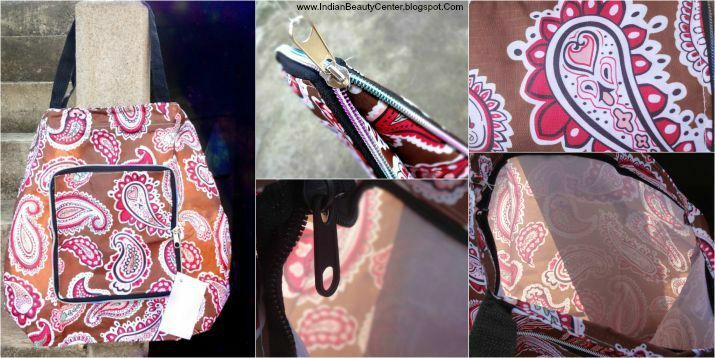 Also, this bag can be folded and kept in your handbag and you can just unfold it to use it as your carry-bag! Simple design but very effective. I have just fallen in love with this. Overall, my shopping experience with STYLETAG.com was just an amazing one and the quality of products is beyond fantastic and the discounts are just too tempting. 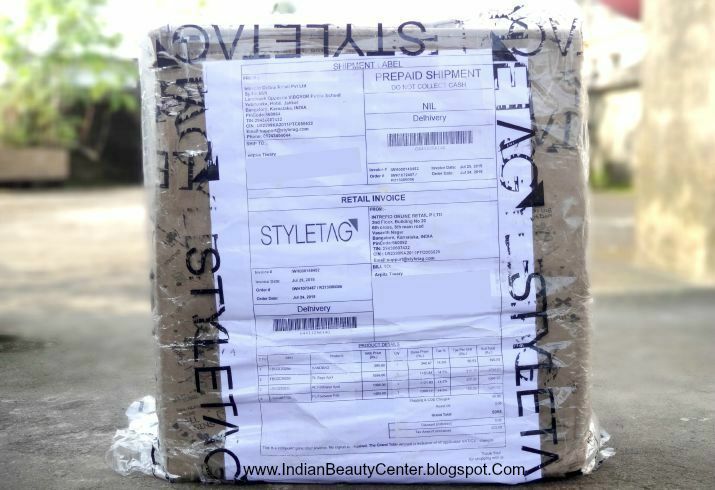 I am very happy and satisfied with my shopping from STYLETAG.com. Go, shop and feel yourself! I am sure you would also fall in love with their products! Loved the bag and cindrella kitten heels! I have loved shopping with StyleTag. They bring in such lovely brands to you. You picked up some awesome pieces there. i must say they have a pretty cool collection of clothes, jewellry and everything. i must say it is a tough competitor of big shopping sites like flipkart. on a whole, i loved styletag.